For the City - Audiobook | Listen Instantly! Within ten years, nine out of ten people will claim “no religious affiliation.” Many of these people will live in urban areas. Church leaders must learn how to effectively engage in ministry with this urban core, a group that includes both the poor and marginalized as well as the wealthy and influential. This book will guide readers in developing a philosophy of ministry that can lead to restoration and renewal in their city. 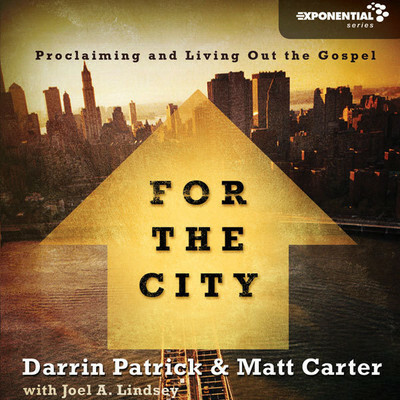 Matt Carter and Darrin Patrick explain the biblical, theological, and historical foundations of ministry within the urban core and how to plant churches where the gospel is not only faithfully preached and shared but also brings substantial benefits to those living in the community. For the City relates the wisdom gleaned from years of serving their cities for the sake of God’s kingdom. Carter and Patrick practically equip church leaders and Christians to look at their city as a mission field where individuals and churches can faithfully proclaim the gospel and live out the reality of a community changed and transformed by its message.
" What I liked best about this book is that it chronicles the birth and growth of The Austin Stone. If you want to understand the heartbeat of my church, read this book! " " Excellent, easy to read book about gospel centered change in your city. It's more than social justice, it's about how to help those around us now that we have been helped by the grace of Jesus. " " Great book...living FOR the city! God is glorified when His Church lives out the love, grace & mercy of Jesus in the midst of the city. " " Interesting read, a little out of context for me (the majority of the book was about church planting). Loved hearing the story behind one of my favorite churches, Austin Stone. Worth the read for the chapter "community" alone. " Chris Tomlin, closely identified with the Passion movement, is the familiar worship leader from OneDay. As one of the premier songwriters of today, his own albums include The Noise We Make and Not To Us. God has used Chris to bring passionate worship to college campuses and in his local church for about five years. He presently lives in Grand Saline, Texas.